Yes you read correctly. This is the quilt that I started just before Christmas and which was meant to keep me warm in the Winter but sadly was only finished a few weeks back. But there will always be another Winter and to be frank it has been a bit cold in the nights lately which meant it actually has been residing on my bed for a while. This is a very large quilt with 70in x 80in and is perfect for my king size bed. I am sure you will remember that I have been collecting and playing with these low volume prints for a while now, starting with my one-year long hexagon project. I then went on to make a cushion in the same prints only to right away decide that I needed a much larger quilt in the same prints. So I went back to the Cloth House in Soho where I know I can get lovely linens and in addition I dug out every piece of low volume I could find in the house. Piecing this quilt was difficult because many of the fabrics used were very soft linens and others very course and thick, some new French delicate linens and some very old ones from my grandmother. 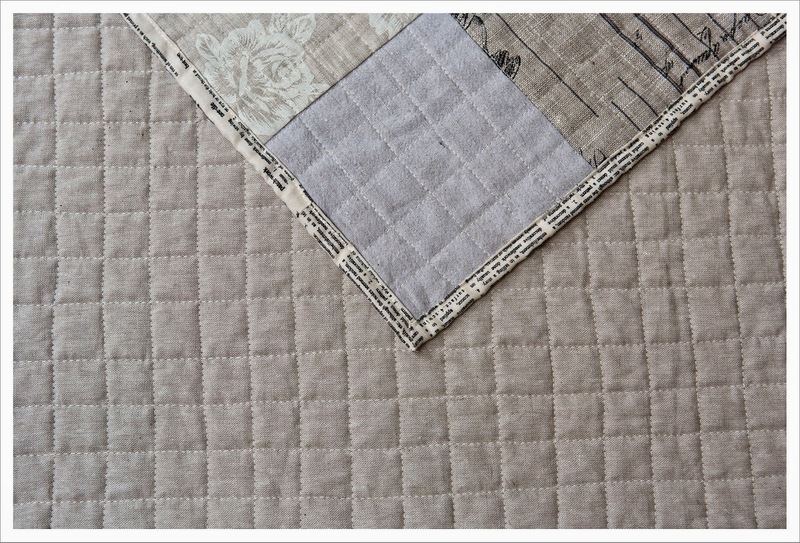 I would have had an easier time piecing if I had used interfacing to stabilise the softer linens. When I had to decide on the quilt back I procrastinated for ever but finally decided on Essex Yarn dyed linen in Flax. This is a beautiful fabric but heavy and heavy I wanted but it meant that quilting in a one inch crosshatch pattern was very hard work and not at all enjoyable. So I took my sweet time with it. 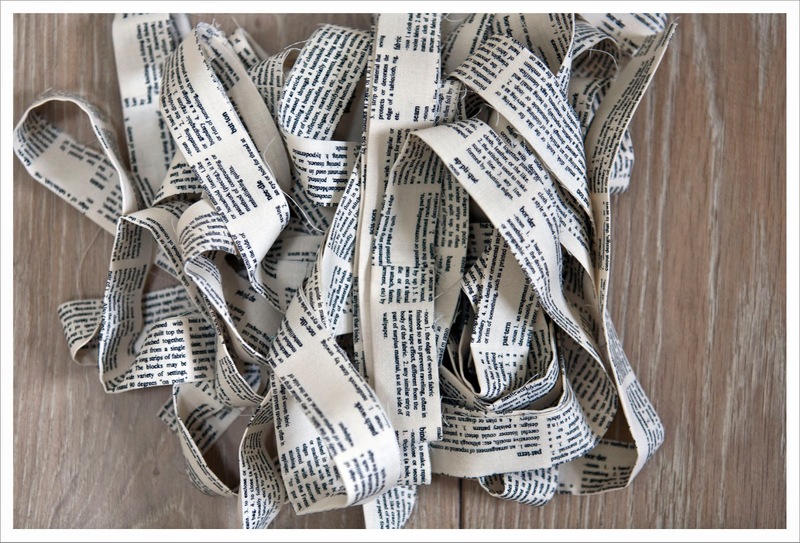 I bound it with one of the best text prints ever from Sweetwater's collection 'Mama Said Sew' called 'Words Dictionary'. 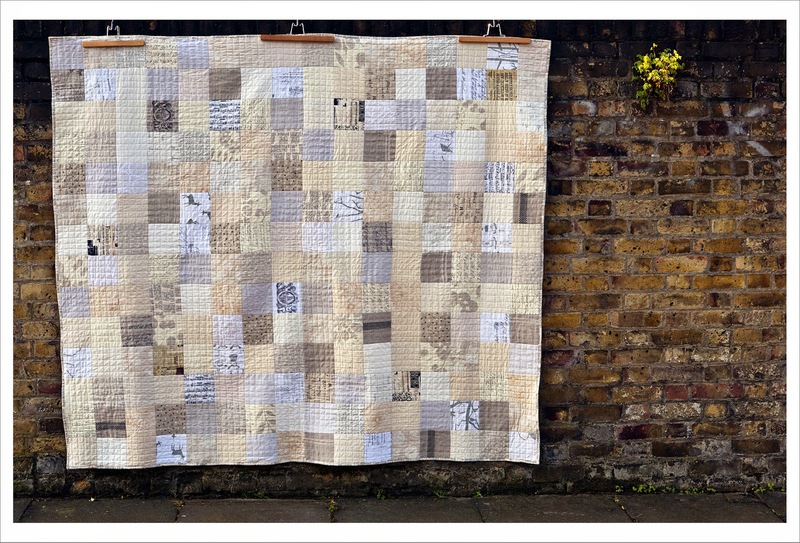 Although I haven't had the best time making this quilt, I do love it and am always happy when I look at it. It is stunning and works very well with my white/grey/beige bedroom. 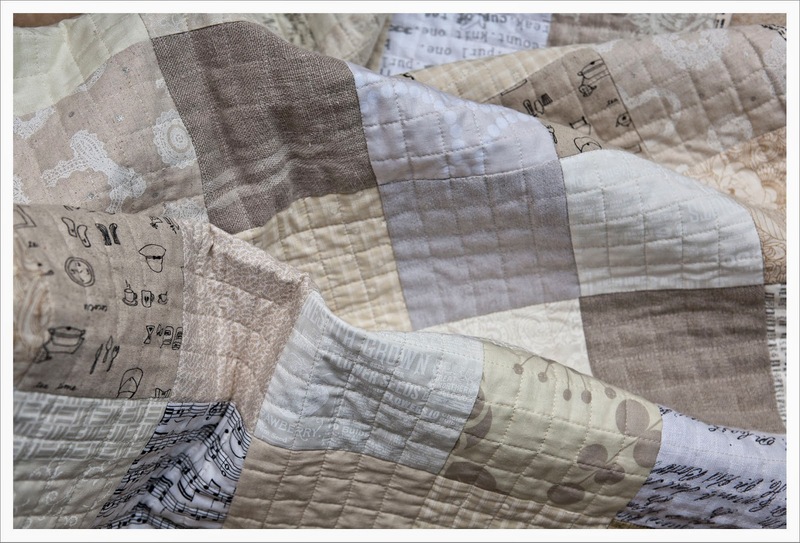 Older blog posts regarding this quilt can be found here, here and here. Wunderschöner Quilt! 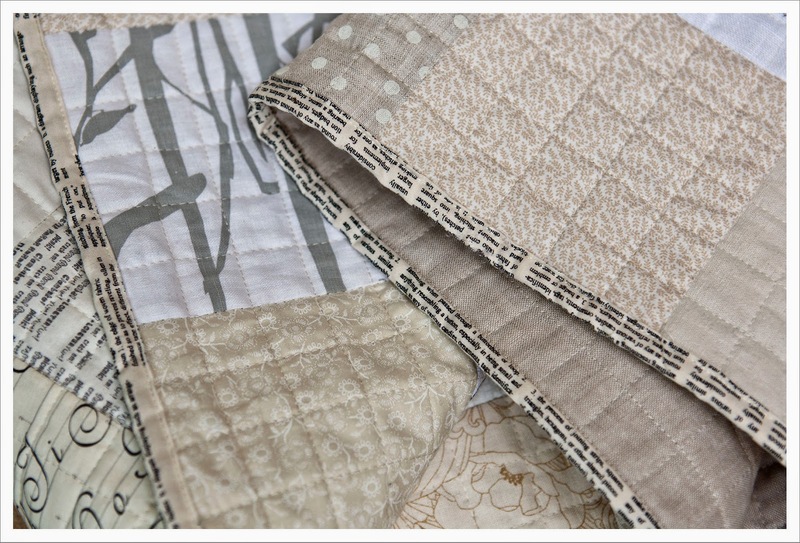 Binding und quilting passen echt perfekt! Absolutely gorgeous! 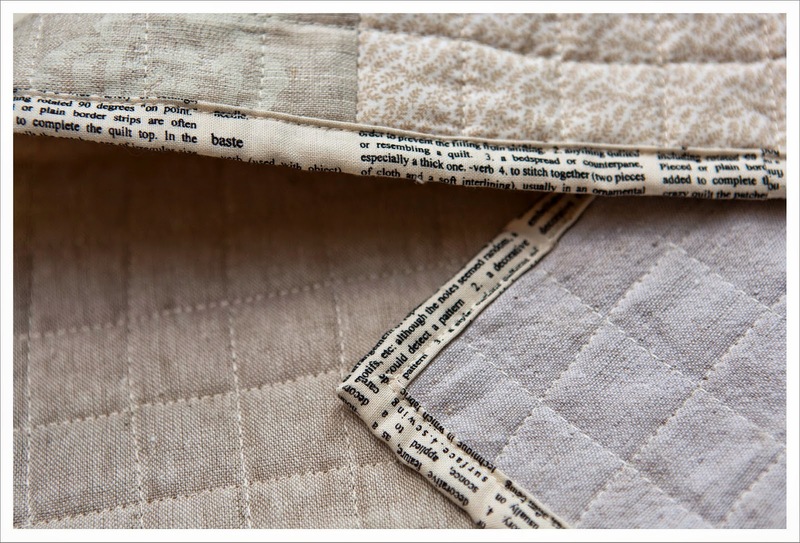 I love the Essex linen for the backing; with your quilting it could be a reversible quilt! It's beautiful and I love the binding! 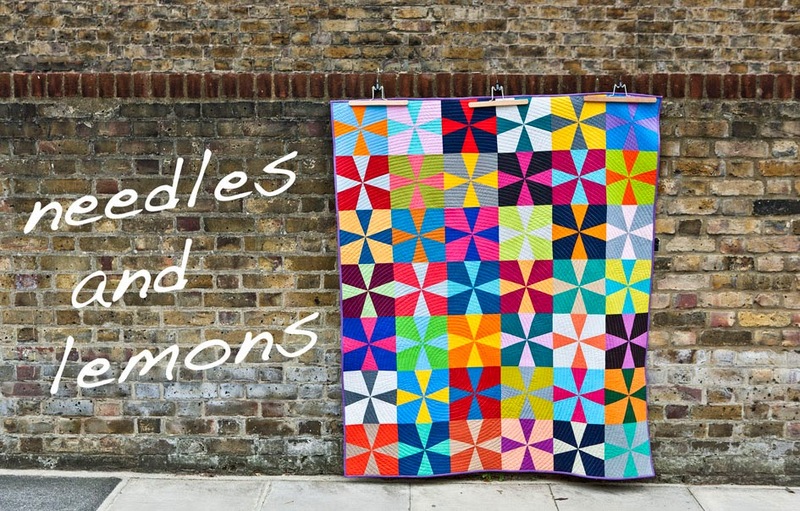 Your quilt is beautiful and you are right...there will always be another winter and maybe some chilly Spring evenings? The hard work on the one inch grid was so worth it. Looks fabulous. Great job, and it only took a few months. It is absolutely stunning. I'm so glad you persevered! !